Podcast Episode 16: Aren’t Horror Writers Nice? 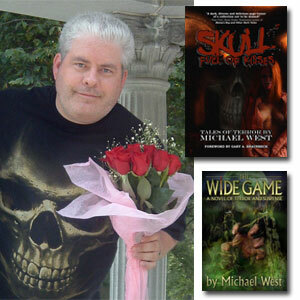 The Genre Traveler is back in the saddle again and chatting with horror author Michael West. Our conversation covers giant monster movies, campy horror flicks, Hershey’s Kisses, why love is the perfect topic for horror, Michael’s short story anthology and his forthcoming book, bed bugs, how nice people in the horror community are and more. Oh … and we both love to laugh. Note: This podcast was recorded late last year, so the reference to “February of this year” is February 2010. Captain Cosmic – I won a T-shirt on this show and still have it! The Son of Svengoolie (Chicago) – would you believe my sister and I had a crush on this guy? This horror anthology was Rod Serling’s follow up to The Twilight Zone and aired 1970-1973. The episode Michael mentions in this podcast was “Death on a Barge,” which originally aired in 1973, starred Lesley Ann Warren as a woman who lives on a barge, marooned there by her fear of crossing running water. Often called “King of the B-movies,” Corman is a master of the low-budget film. Many filmmakers have gotten their start working with Corman, including Francis Ford Coppola, Martin Scorsese and Ron Howard. In this podcast, Michael mentions Attack of the Crab Monsters, which came out in 1957. Sammy Terry was a horror host in Indiana from 1962 to 1985. Richard Matheson – author of such classics as I Am Legend and What Dreams May Come. Also wrote the script for several The Twilight Zone Episodes, including “Nightmare at 20,000 Feet,” starring William Shatner. Bruce? Is That Really You?